Last night Stu, Mark, Denz, PJ and I went to see John Grant perform at the Jazz Cafe in London's less than glitzy Camden Town. This particular Q Award nominee is hot right now. And as if to increase the Zeitgeisty feel of the evening even more he mentioned attending the Attitude Awards two nights earlier (where he picked up Man Of The Year) and got to meet his gay heroes Marc Almond and Holly Johnson. Bless him. He knows his roots that boy. Stand out songs of the night were I Hate This Town, Vietnam, Pale Green Ghosts, the single GMF and encore-ending / crowd-favourite Queen of Denmark. Sadly the much hoped for appearance of backing-singer Sinéad O'Connor swinging naked across the stage on a wrecking ball never materialised. Not so much as a twerk. 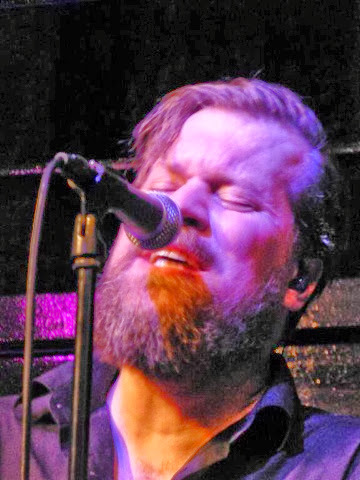 Roll on John Grant's next London appearance at the Roundhouse next March.